Ask fellow campers about "Crooked River State Park" and nearby attractions. Question: Is there any OTA TV reception available? Grocery store nearby? Answer: Yes, the Jacksonville, FL OTA towers are about 40 miles away. Our rooftop Winegard Sensar antenna picks them up ok. I will add my delight to the 5 star reviews. This was a wonderful park, well run, clean, spacious with all amenities one would need and convenient to boot. I did change the "no" laundry facilities to "yes" as there is a washer and dryer in each of the 2 Comfort Stations. The machines are nice and new and only $0.75 a load. The dryer on our loop (riverside) was out of order but being fixed when we left. The CG hosts circulate all the time and are very helpful. There are sites with sewer there is a dump on the way out. Water pressure was excellent at 40 psi. The trails are wonderful but the no-see-ums (or what ever you call the infernal tiny biting missiles) are awful at dawn and dusk especially. One of the hosts told us of a product they use. It's Olive Oily Hair Sheen Spray (available in the hair products aisle at the local Winn Dixie but NOT at the CVS) It has coconut oil in it so that's what it smells like and those little biters do not like it. Our site was a little more exposed than we would have liked but #19 looked like a perfect spot. We camped at Crooked River State Park in a Motorhome. Many people go to Cumberland Island while staying here which is a not to be missed opportunity-one note: unless you are a very good cyclist don't bother taking your bikes. The road (you may not ride on the paths) is deep sand and very slow going. Don't miss the Submarine Museum or walking around historic St Marys. Beautiful. I believe there is only 62 RV slots. The sites are very large and compared to a normal cash cow campground, your neighbors are not sitting on top of you. So having a campfire, cookout, and setting up your chairs is comfortable. Lots of trees and places to walk. Everyone was friendly and easy to work with. My rig: 42' 5th wheel with a total length of 58'. I had no issues backing into my site. There are pull throughs, but no available when I arrived. One of my favorites so far. We have a 376th Grand Design, so we are hauling a motorcycle. I enjoyed riding over to Folkston Funnel and sit for awhile and watch a couple of trains. We also road over to visit Fort Clinch in Fernandina Beach. I could also see myself going back to Crooked River just to relax and do nothing at all. 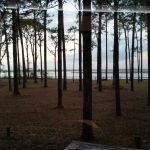 We camped at Crooked River State Park in a Fifth Wheel. A well managed park. It is what you would expect for a rating of 9. The registration staff were pleasant and helpful. We came in a couple of hours before check-in(1pm) and asked us to wait in an adjacent parking lot for the site to be cleaned. Fifteen minutes later we got the call. The campground is very clean, spacious, open and easy to manage your rig. All sites are level and long. There is several camp host and they are alway busy doing something. The roads are like-new blacktop with gravel sites. Half of the campsites (east side) have sewer hookup which is not mentioned on ReserveAmerica. Good Verizon and received ~20 OTA channels. There are several well maintained hiking trails that can be biked, a bird watching blind and a couple of raised stands for watching wildlife. We would definitely stay here again! 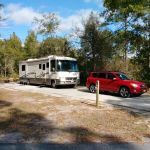 We camped at Crooked River State Park in a Fifth Wheel. We spent 12 nights here before moving on down to Florida, and enjoyed every minute of our stay. The recently rebuilt sites are spacious and kept very clean by the great volunteer staff. We were on the full hookup loop, and the electric, water, ad sewer hookups were well placed and easy to use. The restroom building on our loop was brand new last year, and has four family style private bathrooms, two of them handicap equipped. The building also houses two washers and dryers, with loads just $0.75. The park is located about 20 minutes from a large number of stores and restaurants in St Marys and adjoining Kingsland, including a Super Walmart and many others. We will be back here for another week when we start our northward trek in the spring, and very much looking forward to it. We camped at Crooked River State Park in a Motorhome. The park has several hiking trails, as well as a bird watching blind and a wildlife observation tower. I have been so impressed with the quality of Georgia State Parks and Crooked River is no exception. Beautiful park with spacious sites. Our site included sewer. No wifi or cable, but hotspot was fine and we could pick up major networks with the antenna. Good size fire ring that came in handy on a chilly night. Restroom facilities were conveniently located. Camp Ranger and Campground Hosts were very friendly and helpful. We were treated to a spectacular viewing of the Wolf Blood Moon as there was no light pollution. A wonderful camping experience. We camped at Crooked River State Park in a Motorhome. We loved this campground because the sites are huge, nicely spaced and we had a good amount of privacy between neighbors. It was also nice to have full hookups at a state park, but that also made the park a lot more expensive than most state parks. We visited the nature center while we were there which was worth a visit. Verizon, AT&T and T-Mobile worked great there. 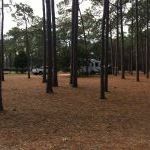 We camped at Crooked River State Park in a Fifth Wheel. By and large the park is very nice. The sites are level and spacious. Water and electric hookups are very good, and sewage is available at some sites - otherwise there is the dump located away from the campground perhaps half a mile away. The road in the campground is marked one way and strictly enforced which makes getting to the trash dumpster a bit circuitous. Washroom/shower was clean and hot water plentiful. The only downside were the no-seeum's...plentiful and very much in a biting mood. We camped at Crooked River State Park in a Motorhome. 50 amp, W&E back-in site adjacent to the river. We had not been here since 2011 but remembered it as a beautiful park and it really is. The views of the river and the marshes are simply wonderful. The sites are well laid out and maintained. Approx. 25 OTA TV signals and our cell phone hot spots worked fine here. About the only "rub" is that the State of Georgia hits you up for $5 if you are from out of state. Senior discount was 20% which was wiped out by the $5 extra out of state charge. 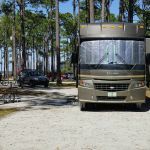 We camped at Crooked River State Park in a Motorhome. Approx. 6 miles to St. Mary's. Cumberland Island is worth a visit. King's Bay Naval Base is here also. There is a $5 fee to enter the park. Campsites and one bathhouse are being renovated. Only one bathhouse at present. Some pull throughs. about half full hook ups, but may change as renovations are made. Some tricky turns for big rig. Beautiful state park on the river. Nature Center, boat ramp, wildlife viewing areas. Camp store and marina store. We camped at Crooked River State Park in a Motorhome. St Mary's is a quaint town. Take the ferry to Cumberland National Seashore. We arrived int he morning to find an amazing waterfront site available. It was a pull through and level. The campground was undergoing renovation during our stay and our site was one that had already been spruced up. The park staff was friendly and our stay was enjoyable. We camped at Crooked River State Park in a Tent Trailer. Walmart and Publix are about 10 minutes away. Bring Skin So Soft for the sand gnats. This is a gem of a state park. It is about 20 miles off the interstate and a GPS with updated maps will take you to the front gate. There is a Pilot/Flying J at the exit, however, the pumps are perpendicular to the store making it difficult to access them in a large class A. The customer service when checking in is excellent as are the rangers on duty. The park itself has been recently renovated and many of the sites are now 50-amp FHU. By next year you will be able to reserve specific sites. Our site #46 was a large pull through with 50-amp FHU. The utilities were all new and right next to the rig. The site was perfectly level and we didn't have to use either blocks or the jacks to level the rig. Sites that are now FHU are: 5, 6, 39, 41, 45, 46, 47-49, 51-56, 58-62. Either pull through or back the sites that I observed were extremely easy to get into. The roads in the park are all paved and of ample width. There are no overhanging trees nor trees on the side to snag or scratch the rig. The campground for RV's is easy to find and access. Within about 20 minutes of the park there are a number of fast fool restaurants, a Winn Dixie, a CVS and other stores. If you have the opportunity try to get to Missy's Kitchen - you will not regret it. Cumberland Island National Seashore is the main attraction in this area and it is worth coming for. We took a guided tour with Land and Legacies Tours and it was fantastic. We would go back to the Island again if only to go to the beach and/or walk some of the trails. We would definitely return to this state park. We camped at Crooked River State Park in a Motorhome. Park currently under renovations. Updated to have sewage connection and second bathhouse. Higher numbered site have full hook ups. At present when reserving not assigned site- told sites will be assigned mid June or July 2018. Sites 40-62 good ground coverage. Some pull thru, some back in. Gravel sites with stationary picnic table and fire pit. Bring screen house or tarp for picnic table. Paved side roads throughout park. Well maintained park. Security gate at night with pass code. Nice nature trails with lots of birds. Bird observation hut. Nature center has many activities for small fee-$1-$5. We camped at Crooked River State Park in a Motorhome. St Mary's is a historical town. Neat Main Street with many quaint shops. Submarine museum to visit. St Mary's has a boat tour. Kingsland has grocery stores and other shopping - -10-15 minutes away. The rate reflects a senior's discount that was refunded to us at check-in less a $5 car pass fee good for the duration of our visit. Our back-in site was quite large, with plenty of room for our coach and car. The roads are paved, and the gravel sites reasonably level. As other have said, this is a pick your site on arrival park, with reservations only guaranteeing there will be a site available. The sites are currently wtaer and 30 amp electric only, but only about one third of the total sites were available for use when we were there, since the other sites were in the midst of being upgraded to 50 amp and sewer connections, as well as one of the two bathroom/showers due to be torn down and replaced with new family style units. The section we were in will be shut down next, when part of the upgraded sites are made available soon. We are very much looking forward to returning to Crooked River in March to see the changes. Our AT&T and Verizon cell services worked well here, and the Jacksonville, FL area local TV stations are easily viewed over the air. We were able to get a good satellite view with our portable dish, but some sites would be more difficult due to the large number of tall pines. This was our first visit here, but it certainly won't be our last! We camped at Crooked River State Park in a Motorhome. There are many stores and restaurants in nearby Kingsland and St Mary's. One of our "must go to" restaurants is "Ship-2-Shore" with an excellent menu of seafood choices at very reasonable prices. This is a beautiful state park with nice amenities. We stayed in site 11 on the left hand side of the campground, a pull through site with gorgeous views of the river. It was the nicest site in the entire campground in my opinion. There's good separation between sites, although no vegetation so you see your neighbor. All sites are gravel/dirt with water and 30 amp electric only (with a handful of 50 amp sites), and while you can make a reservation, you cannot reserve a specific site. As other reviewers stated, the cable hookups do not work, but we were able to get around 20 OTA channels. Verizon service was fair to good. They have a small camp store, but it is more of a gift shop so there are very few camping necessities. The park is currently undergoing extensive renovations to upgrade the sites to 50 amp with sewer, as well as new gravel pads and better defined sites. The right-hand side of the campground is closed at this time while they complete the upgrades, so there is constant construction noise going on during the day. The park has a boat launch, bait shop, small nature center and miniature golf (less than $5 per person fee). Also, the park charges an additional one time $5 entry fee in addition to the camping fee. Fishing from the shore is lacking, as you can only fish from the boat dock area or from a very small area at the end of the River Trail. You can go online and get a one day, non-resident fishing license for $12.50. The park also has nice biking/hiking trails, and resident gopher tortoises roaming around. A word of caution though, there were swarms of biting gnats/no see ums while we were there (due to the unusually warm weather and the marshy area I presume) which made being outside unbearable. Several campers left early because of them. Make sure you have your entire body covered with clothing, as they will bite any skin exposed and use a strong bug repellent. Overall, we enjoyed our stay and would return again in the future. 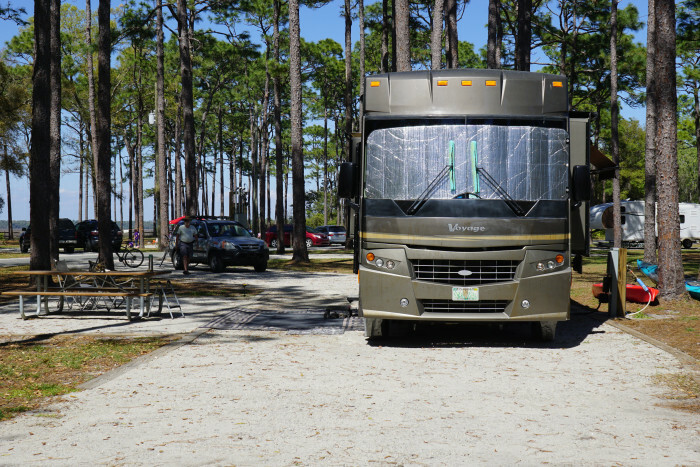 We camped at Crooked River State Park in a Fifth Wheel. Nearby St. Marys is a nice, seaside town. Its small but worth visiting. Lots of good restaurants and cute shops. On the main road by the campground there is a Publix grocery store, Walmart, plenty of auto stores, etc. There is a ferry that goes to Cumberland Island National Seashore in town. There is a submarine museum, historical town of St. Mary's, and plantation mill ruins outside of the state park. St Marys is a nice, interesting little town. The submarine museum was small, but full of a lot of memorabilia, interesting information and videos. Jekyll Island, north about 25 miles, was a great place to visit. Fascinating history and restored buildings. We will go back there. Enjoyed a guided kayak tour. Boats and kayaks and bicycles available for rental. Several trails for bicycles. Really enjoyed biking there. The Sub museum in St. Mary's is small, but worth the small entrance fee. Most of their artifacts are from WWII, with a few from nuclear subs after WWII. If you're looking for good seafood, I HIGHLY recommend "St. Mary's Seafood and More" restaurant on the main road to town. Excellent food and prices. They have special lunch prices until 4PM. Plenty to see in the area. Great food and shopping within a few miles. Check in at the bait shop at the boat ramp for fishing and kayaking advice as the tides greatly affect both. Visit Jekyll Island (about 35 mi away) and St. Mary's (most shops closed on Mondays). Are you affiliated with Crooked River State Park ?